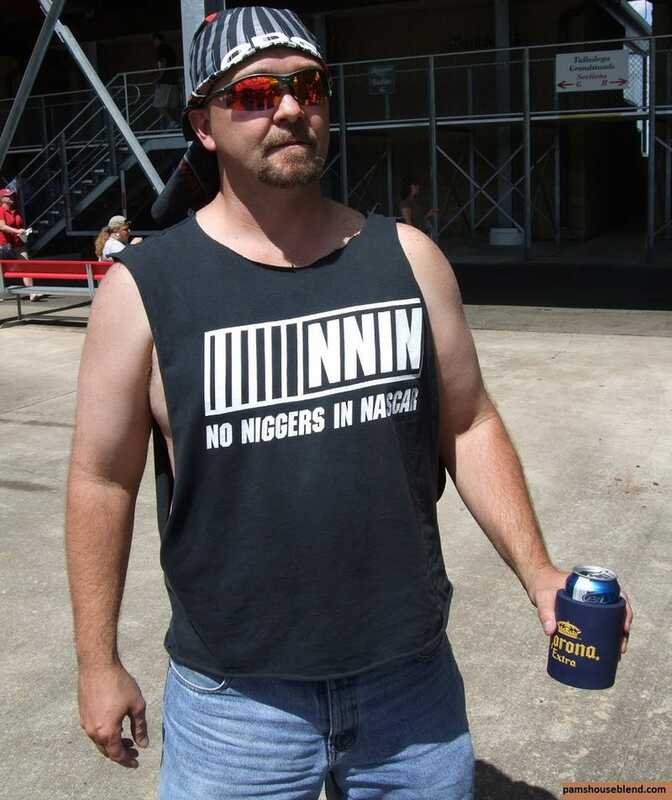 Despite NASCAR's white-washing PR, one redneck fan at last month's Talladega 500 shows off what may be the new NASCAR enthusiast uniform: cheap beer in a cozy, giant Fauxkleys, and a sleeveless t-shirt proclaiming "No Niggers In NASCAR." This shirt is a reminder that NASCAR, despite its official messaging, has a fan base that puts the white in bread — and they're happy to have it stay that way. "Demographic analysis found that while blacks represent only 8.6% of NASCAR's audience, it's a 12% spurt since 2005. Apparently that fact has caused consternation among some of the blue collar bigots that now have to sit in close proximity to more of "those people."